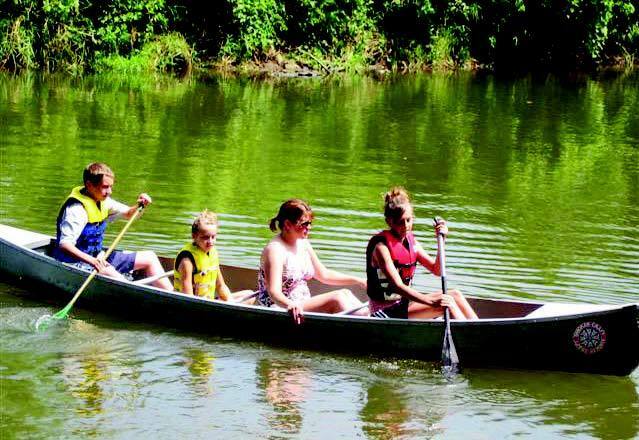 Take a canoe trip on the Elkhart River or enjoy Fidler Pond with a canoe, kayak or pedal boat. Lifejackets are provided for ages 4 and up (not recommended for children ages 3 and under). An adult must accompany children under age 18. Maximum capacity per canoe: two adults and two children or three adults. Plan accordingly! Please take note of the water currents, obstructions and weather. Please do not litter. Pack it in, pack it out! Visit the red barn at Fidler Pond Park, 1424 Lincolnway East, for your boat rentals. One- or 2-hour boat rentals. Rentals offered daily beginning at 8 am; all boat returns are 1 hour prior to dusk, so please plan accordingly. Canoe, kayak and pedal boat rental fees are $10 (tax included) per hour per boat. Fishing pole rental (for bank fishing) is $2/2 hours. Lifejackets are mandatory while on Fidler Pond; if you bring your own canoe or kayak and need a lifejacket, rental is $2/2 hours. Shanklin Park on West Plymouth Avenue to Ox Bow County Park. Trip length is approximately 4 hours. Canoe trip is offered daily: 10 am departure, 2 pm pickup. Shuttle service is provided from Ox Bow Park back to​ Shanklin Park. Parents/guardians must supply car/booster seats for children. Visit the Goshen Park Department Administration Office 96 hours in advance to make your Elkhart River canoeing reservations. Rental fee is $20 + tax per canoe. Deposit is $20 per canoe + valid driver’s license. 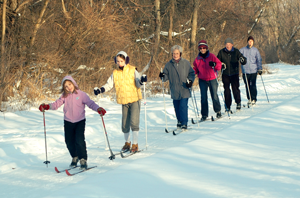 Tubes and cross-country skis are available to rent at the Goshen Parks & Recreation Office, 524 East Jackson Street. Neither Abshire Cabin nor the tubing hill is staffed. Season begins in December 2019 and ends March 31, 2020 (when there is sufficient snow cover). Weekend rental includes Friday pick-up and Monday drop-off. A fee of $10 plus $0.70 tax per day for skis and $5 plus $0.35 tax per day for tubes will be charged if kept beyond the scheduled return time. To view current programs and activities, please consult the 2018-2019 Fall & Winter Program Guide.